WE HAD ABSOLUTELY NO intention of buying a house. Our American foursquare had enough Arts and Crafts touches to satisfy our modest desires, and we had only a few years left on the mortgage. So it was just to kill time before a family dinner on New Year’s Day in 1989 that we decided to go to the only open house listed in the paper that holiday weekend. Looking from the dining room (with original lighting) into the living room through one of the two gumwood arches that dominate the center of the house. “Arts & Crafts bungalow,” the ad said. “Quiet neighborhood.” Within 30 seconds of walking up the Medina stone steps, into a sort of mudroom, my husband, Jim, was gripping my hand and whispering through clenched teeth, “I want this house!” Never mind that it had been sorely neglected, not to mention badly remuddled, and that it would stretch our budget to the limit. Two days later my diary reads “I can’t believe it but we bought that house.” And so began 20 years of restoring our 1912 beauty to its former glory. little gem could be constructed for about $3,500. The Rochester house was built by Arthur C. Sheffield, a printer by trade. 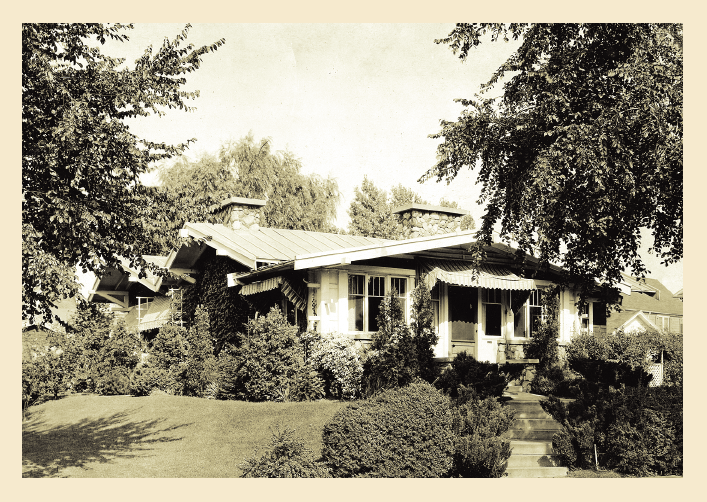 Rochester’s building costs may have been higher than those in Pasadena, because Sheffield ran out of money before finishing it and never got to live here; in October, 1913, he sold it to Mr. and Mrs. Judson Phelps, proprietors of a paint and wallpaper business, for $11,000. When Jim and I visited the original Pasadena house with Bungalow Bob in 1995, we were able to see all the details that had been planned for the interior here but never realized: three-quarter paneling with a plate rail, stained glass and a copper fireplace hood with poinsettia motifs, and built-ins with canted wooden pillars rather than straight ones. The house’s enclosed fountain court with downspouts visible in the corners, was also originally left open. it was transformed by the Vias into a sun-drenched atrium. The home was designed and built in a U-shape around an open courtyard that featured a burbling stone fountain. This design makes sense in Southern California, but it is not a good idea in upstate New York. Period photographs reveal that after only a couple of harsh Rochester winters, the Phelpses realized the folly of such a plan and had the courtyard enclosed to create the mudroom. By the time we acquired it, three more owners had made changes to this feature of the house. 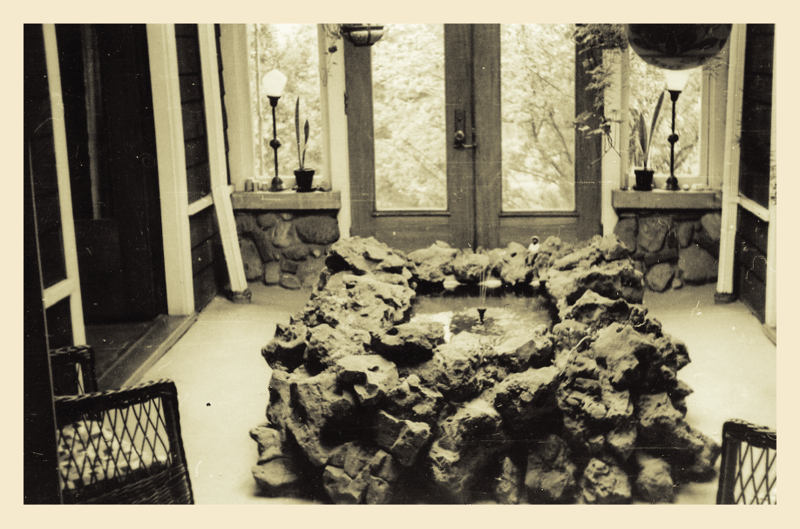 The fountain and its pool had been removed as a potential danger to children living here in the 1950s; a third of its square footage had been eaten up by particle-board closets added in the ’70s; and pipes that had been added to the guttering system were leaking through their flimsy enclosure. We ripped out the closets, tiled the floor, fixed the pipes and built hollow beams to enclose them. To evoke the open, light-filled space it had originally been, we raised the roof and installed three skylights to create an atrium that now serves as the house’s main entry, around the corner from the enclosed front porch. 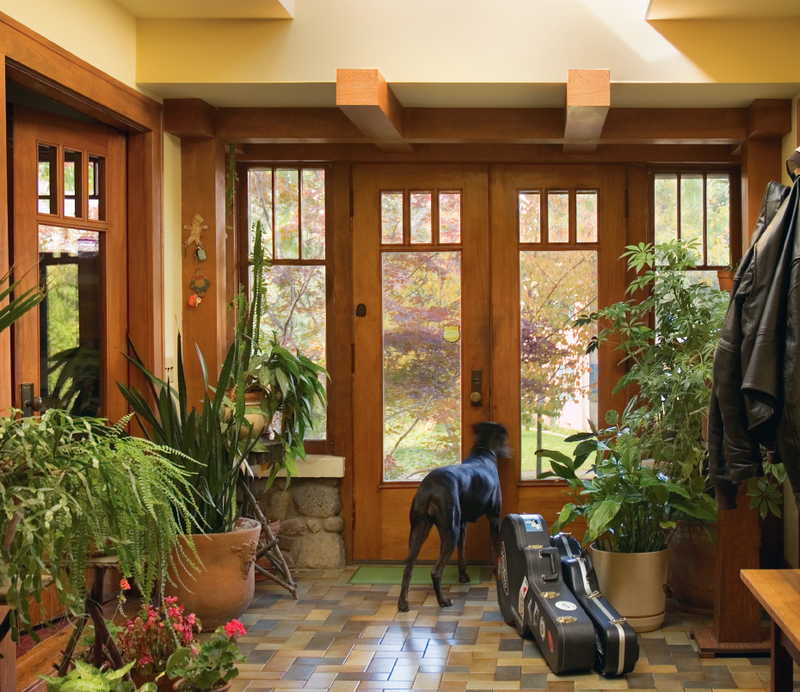 Maisie, a greyhound-doberman mix, stands watch in the atrium. As a final touch, we painted the walls a warm color from the Sherwin-Williams Roycroft palette, aptly named Hubbard Squash. Now, filled with plants on rustic twig stands, Jim’s photographs, period lantern fixtures and a few utilitarian pieces of Mission furniture, it provides a warm welcome when I return from a long day at work. The rest of the house was in equally dire straits when we moved in. Plaster on the walls and ceilings was badly cracked, and every room had been sloppily whitewashed before the sale. Fields of brown shag carpet had been abused by pets. Truly horrible 1970s lighting fixtures thumbed their noses at us, and although some of the original bathroom fixtures had survived, they were all but nonfunctional. The first time we painted, we chose deep shades of green and blue, thinking to make the woodwork pop; the second time around, we picked softer colors that would make the most of the dim interior light—the green of new buds, the blue of sea glass, the gold of sunstruck old plaster. Jim made stencils for the kitchen and three front rooms and custom-painted them as a surprise while I was out of town. His meticulous plastering skills reached their zenith in the difficult barrel-vaulted ceiling in the breakfast room. We hauled the brown shag to the curb, refinished the original oak floors and scattered oriental carpets around the house. Out went the faux-Spanish and faux-atomic chandeliers; in came an original schoolhouse fixture and Mission-style lanterns. A friend who was sure he could fix it adopted the ovoid pedestal sink from the bathroom; we kept the white subway tiles (Jim even hand-cast bullnose pieces to replicate a few that had been damaged) and finally made peace with a simple new vanity that offered storage space and a sink that actually drained. The kitchen was the ultimate challenge: hideous peel-and-stick floor tiles, plywood countertops, dark press-board cabinets, and no lighting or electrical outlets to speak of. We did a total gut job before installing Corian counters and glass-fronted cabinets Jim designed to match the mullioned built-ins elsewhere in the house. The small octagonal floor tiles we selected mimicked the look of cork, and we covered walls and backsplashes with white, green and rust tiles in a Dard Hunter–inspired pattern. Our concession to modernity was recessed lighting (and plenty of it! ), which we balanced with a custommade stained-glass fixture over the sink. Heart of the Home The connecting dining room, living room and inglenook (or “smokery,” as it is identified on the original blueprints) adjoin the enclosed porch along the original front of the home. There are working fireplaces in both the living room and the smokery, the former constructed of brick accented with Grueby tiles and the latter of fieldstone. Sadly, the built-in bookshelves on either side of the smokery fireplace had been ripped out before we arrived, but other cabinetry, now home to books and cocktail supplies, survived. 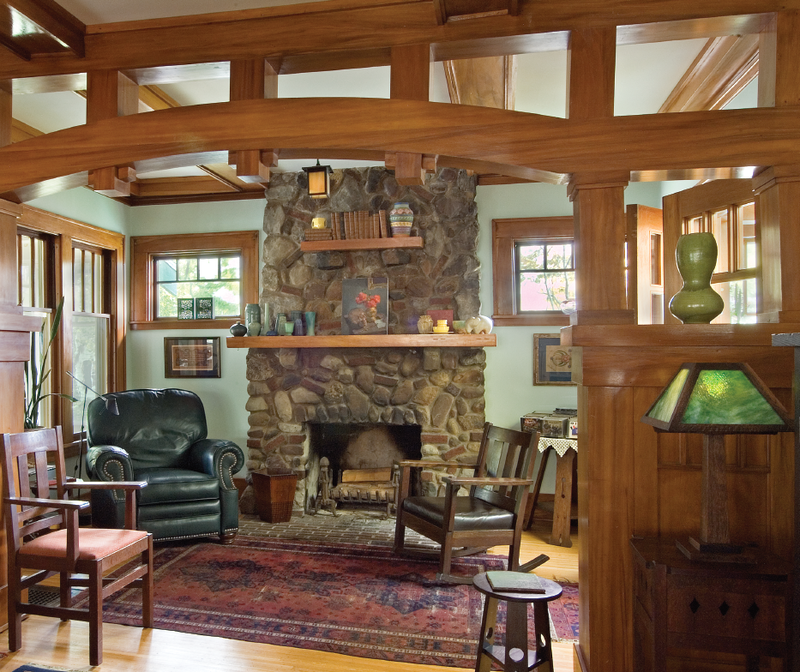 The most compelling features are the ceiling beams and the magnificent gumwood archways that separate the three spaces. To our dismay, a thick layer of polyurethane had been applied over the uncleaned woodwork; the result was an unappealing riot of shiny bumps and brushstrokes. We resigned ourselves to the massive task ofrefinishing it. But—good news, for once!—because the old oil finish (not to mention years of grease and grime) had not been removed before the gloss was applied, we discovered, quite by accident, that we could lift it off without chemicals by covering it with masking tape, burnishing it and peeling it away. Mullioned pocket doors separate the living room from what was the original breakfast room. 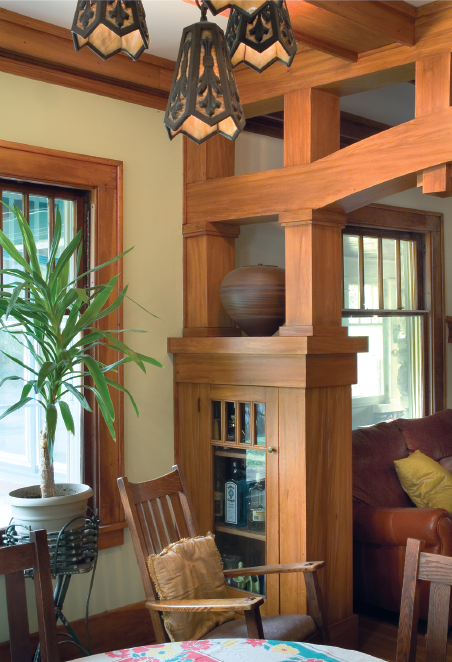 In the winter, when we have a fire crackling in the fireplace, we can slide them closed to keep the sitting area cozy. Likewise, a swinging door can hide the kitchen from the dining room, allowing us to enjoy a civilized meal without staring at the dirty pots and pans required to produce it. 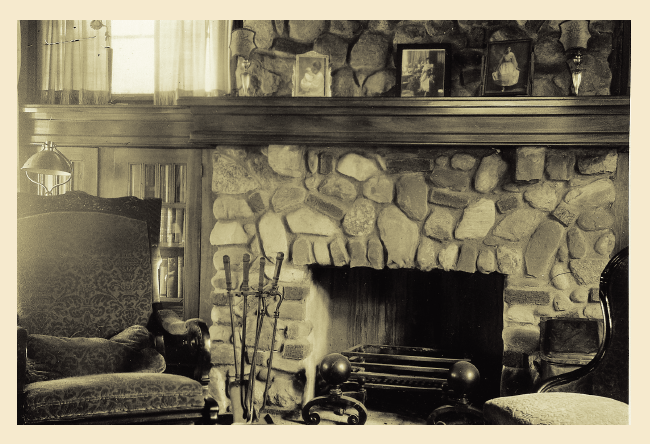 The original mantel and built-in bookshelves are still intact. Like many bungalows, ours has an enormous front porch that runs almost the whole width of the house. It, like the original courtyard, had been open but also was enclosed shortly after the house was built. Although it’s uninsulated and can’t be used during the winter, it’s a cool and breezy retreat from May through October. Large windows draw nature in on three sides. Vintage wicker furniture and an oddball collection of objects ranging from an original “Mission” orange soda sign to copper candlesticks and amateur paintings discovered at yard sales and thrift shops give it a quirky personality. Apart from a new roof, the rest of the exterior needed mostly cosmetic attention. 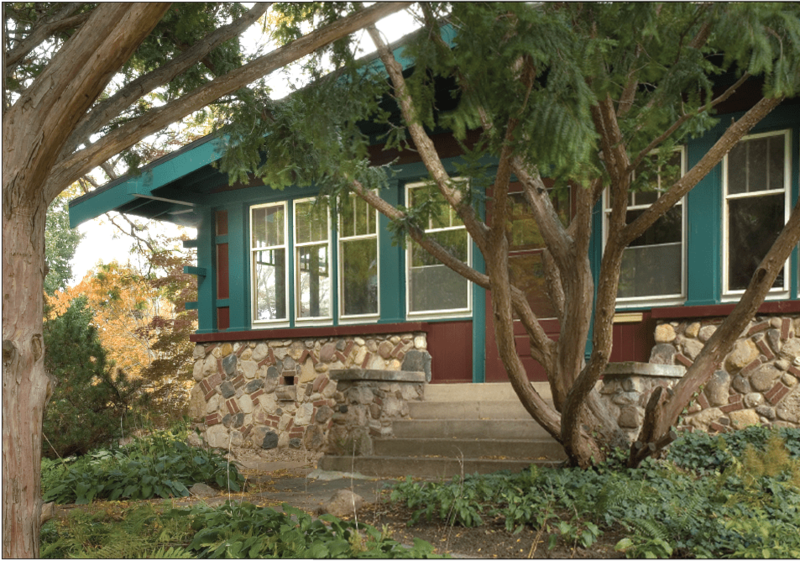 We changed the paint from dark brown on the shingled body and a creepy dead-flesh color on the trim (see “Home, Sweet Bungalow” in Winter and Vertikoff’s American Bungalow Style, p. 116) to a rich claret with spruce accents. The uncoursed fieldstone that clads the bottom half of the house is interspersed with random bricks in the California manner. Into the mortar are pressed pieces of colored glass, some still identifiable as the necks of bottles. We learned that our entire street had been laid out on top of a former landfill; digging in the garden continues to produce wonderful bottles and bits of broken plates, so we assume the stonemasons just added spots of colorful “garbage” in moments of whimsy. The fireplace as it is today. Later research turned up a newspaper article about the competition, from which we learned that the winning criterion was the landscaping, designed and maintained by the owner himself. We, too, have worked hard to create lush and colorful gardens, using old-fashioned species such as tulips, peonies and forget-me-nots for spring; hostas, peonies, bleeding hearts and coral bells for summer; and mums, astilbe, daisies and brown-eyed Susans that last well into the fall. Because we both love getting dirt under our fingernails, it’s a constantly evolving greenscape. becoming a museum rather than a home. Original Stickley pieces coexist with a new queen bed the company offers in the Mission style. Jim’s photos of French standing stones hang side by side with a Harvey Ellis watercolor and an Alexis Fournier painting. Roycroft Renaissance and other contemporary mattegreen pottery is grouped together with period Fulper, Revere and Newcomb. 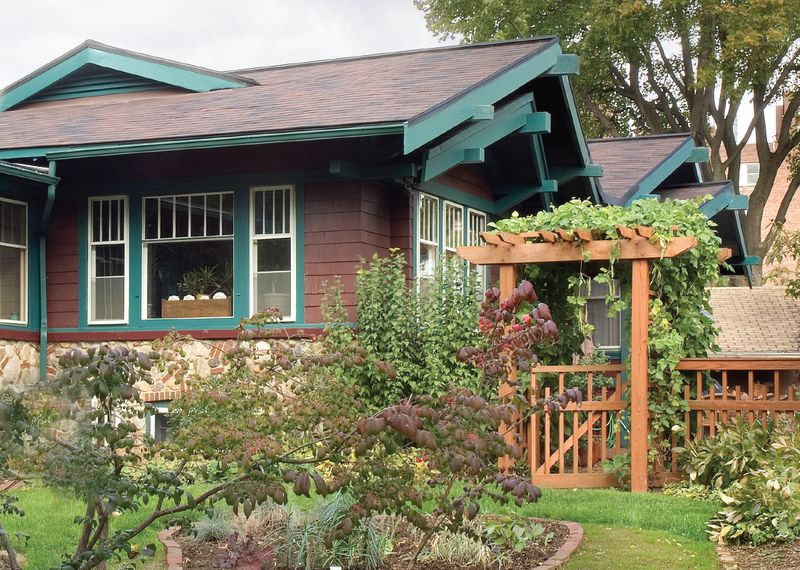 Our little bungalow has been featured in several books and magazines, as well as a PBS special titled “Great Homes of Rochester.” As lovely as it is, though, there will always be projects on the “to do” list. The built-in linen closet in the back hall needs to be repaired and refinished. I’m hoping Jim will continue his stencil magic in the bedrooms and the bathroom. And I suppose the foundation needs to be straightened to eliminate that six-inch slope on one side, although that may have to wait for the next caretakers of this nearly 100-year-old gem. In the meantime, we continue to love it, tilt and all. Marie Via is Director of Exhibitions for the Memorial Art Gallery at the University of Rochester. She is a co-author, with Marjorie Searl, of Head, Heart and Hand: Elbert Hubbard and the Roycrofters, the catalog for the Memorial Art Gallery’s 1994 exhibition of the same name.